A West Palm Beach student, who thought she was accepted into her dream school, later found out it was just a "glitch." Crisleidys Gonzalez, a student at Conniston Middle School, thought she had been accepted to Florida Atlantic High School. As one of her teachers said, "Crisleidys has gone through hell most of her life even after she arrived to the U.S. (moving from Venezuela). Nevertheless, she is a fighter and worked 10 times harder to cope with the challenges of a new school in a new country, with a different language. By mid-8th grade (a year after her arrival) she was one of the best ESOL students of Conniston Middle School. Her ultimate dream was to be accepted in FAU High School." According to the same teacher, Crisleidys was at first rejected, but less than a month later, received an acceptance letter via email. It said that the Florida Atlantic University High School Admissions Committee has selected Crisleidys Gonzalez for admission to the ninth grade at Florida Atlantic University High School for the 2018-2019 school year. 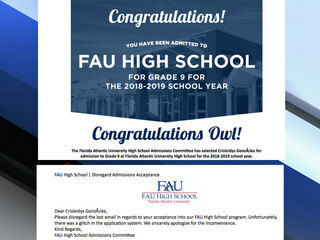 "Please disregard the last email in regards to your acceptance into our FAU High School program. Unfortunately, there was a glitch in the application system. We sincerely apologize for the inconvenience." Monday at 5:00, Contact 5 is asking how many other students were affected by the "glitch" and if those students will get a second chance.